Overview: We have one of the most technically advanced driving simulator suites within a research environment. It uses motion base technology to create a highly realistic and dynamic simulated driving environment. 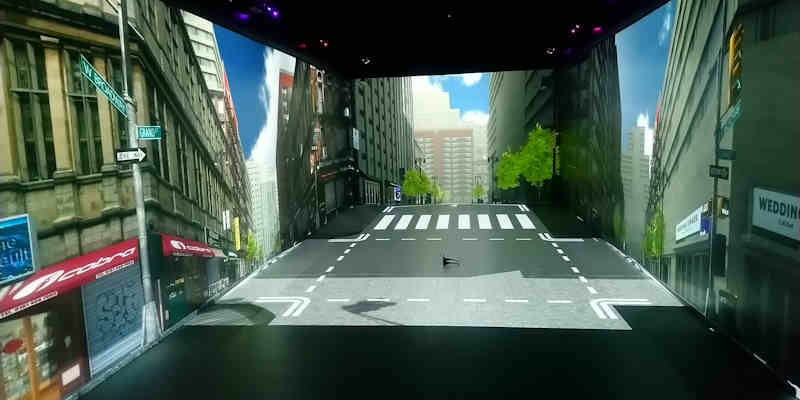 The facility consists of a large motion-based driving simulator, an advanced commercial truck simulator, and a large immersive pedestrian laboratory. The simulators are developed and managed by a multi-disciplinary group of academics. The team – which is funded by research grants and private organisations - has over 20 years' experience developing cutting-edge, innovative scenarios and experiments suited to the needs of its funders. Realistic and repeatable scenarios enable studies on driver and pedestrian behaviour to be conducted in a safe and controllable environment. This substantially reduces the costs associated with the development of real systems, infrastructures or prototypes. The simulator’s vehicle cab is a Jaguar S-type, with all driver controls fully operational. The driver can feel accurate loading on all the normal controls, including the steering wheel and brake pedal. Inside the cab, all of the inherent dashboard instrumentation functions normally. A sound system provides audio cues of engine, transmission and environmental noise. The vehicle’s internal Controller Area Network (CAN) is used to transmit driver control information between the cab and the network of PCs that manage the overall simulation. An eye-tracker is housed within the vehicle cab, allowing the driver’s gaze angle to be recorded in real-time to a high level of accuracy. The LCD dashboard is completely reconfigurable, allowing for a range of driver interfaces to be tested. Touch-screen displays can be mounted anywhere in the vehicle, allowing the simulation of in-vehicle tasks and systems, such as a navigation device. The Jaguar is housed within a 4m diameter, composite, spherical projection dome. A real-time, fully textured 3-D graphical scene of the virtual world is projected on the inner surface of the dome. The projection system consists of three forward and three rear views. High and medium frequency lateral accelerations (e.g. a lane change) are simulated by sliding the whole vehicle cab and dome configuration along the railed track. Low frequency, sustained cues (e.g. a long, sweeping curve) are simulated by tilting the dome and vehicle cab combination. The rails and tracks allow 5m of effective travel in each direction. The motion-base enhances the fidelity of the simulator by proving realistic inertial forces to the driver during braking and cornering. It also provides lifelike high-frequency heave, allowing the simulation of road roughness and bumps. Research on the driving simulator has shaped the understanding of how driver distraction affects road safety, providing guidelines for the implementation of speed advisory systems. Other recent work has focused on the implementation of driver-friendly ecoDriving systems and human factors within highly automated vehicles. The system has also been used to support the design and handling of new automobiles and to test Smart Motorways. The use of the facility is focused on road safety, the research, design and development of new transport systems as well as to understand the fundamental capabilities of humans. City planners, automotive companies, infrastructure designers, government agencies and research organisations are encourage to contact us. Our primary focus is on research especially through industry/government collaborations but we also regularly execute small consultancy projects. Virtuocity, 68 Hillary Place, Leeds.